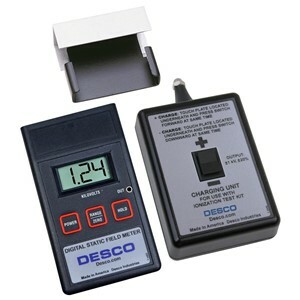 Measures surface voltage and polarity on objects up to ±19.99 kV at a distance of 1 inch. 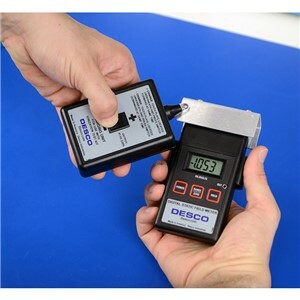 Used to measure offset voltage and discharge times for the periodic verification of ionizers per ANSI/ESD SP3.3 and ESD TR53. Apply charge to conductive plate to measure discharge times. Protects meter from physical damage and minimizes wear. 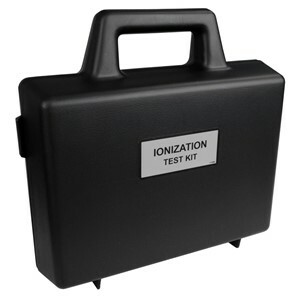 The Ionization Test Kit isolates the conductive Plate and positions it 1” away from the end of the Digital Static Field Meter. The battery operated Charger then allows one to quickly place a +/-1,000 volt charge on the Plate which since it is isolated will remain there for some time. 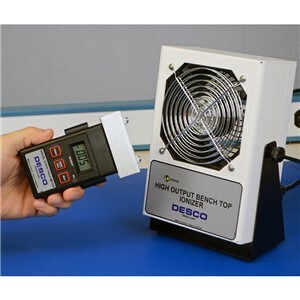 The Periodic Verification of Air Ionizers test in accordance with ESD-SP3.3 is to place the Kit in the Ionizer’s airflow and use a stopwatch to measure the discharge times to reduce a 1,000 volt charge to 100 volts and to reduce a -1,000 volt charge to -100 volts. With the Kit grounded, it can then approximate offset voltage (balance).